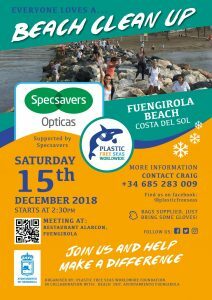 We are pleased to announce that Plastic Free Seas Worldwide, in collaboration with the Beach Department of Fuengirola Town Hall, Spectrum FM’s Pick Up 3, and Specsavers Opticas Fuengirola, are holding their final beach clean of 2018 on Saturday the 15th of December. In 2017, founder Craig Webb introduced a monthly beach clean program, Plastic Free Seas Worldwide, that aimed to rid the Costa del Sol of harmful waste and plastics through volunteer efforts. Plastic Free Seas Worldwide held its first beach clean at Torrenueva; fifteen volunteers attended and 120 kilogrammes of plastic were collected. After a few months, Plastic Free Seas had over 50 volunteers at every event. Their biggest beach clean to date saw 117 volunteers remove over half a tonne of plastic from Cabopino Port. In October 2018, Plastic Free Seas recorded, so far, that 7,500 pounds of plastic had been removed due to their collective beach cleans. Specsavers Opticas Fuengirola are sponsoring this final beach clean as part of their commitment to the environment, joining forces with Plastic Free Seas Worldwide and Spectrum FM’s Pick Up 3. This sponsorship is the latest environmental initiative from global optical chain Specsavers Opticas. In September, they stopped using plastic bags and started using more environmentally friendly paper bags across all eight Spanish stores; a change which will stop approximately 7,000 plastic bags being produced and distributed. Specsavers Opticas also has an “earth-conscious” range of glasses called Eco. Each frame is constructed from recycled or biodegradable acetate in order to have less impact on the environment. For more information visit Specsavers Opticas Fuengirola. Taking place in Fuengirola on Saturday the 15th, Plastic Free Seas Worldwide are taking on the ambitious target of collecting 400 kilos of plastic at their final beach clean of 2018 with the help of sponsors and all the faithful eco-warriors. Fancy helping out? Everyone is welcome, including the kids and the dogs. Volunteers will meet at Restaurant Alarcón in Fuengirola at 14:30. *Gloves are suggested and bags will be provided. For more information call 685 283 009 or search on Facebook at Spectrum FM, Plastic Free Seas Worldwide, or Specsavers Opticas Fuengirola. Cheers to the New Year and ridding our beautiful coasts of harmful plastics!